Facebook and Twitter may be dominating the social sharing scene now, but Pinterest and LinkedIn refuse to be left behind. 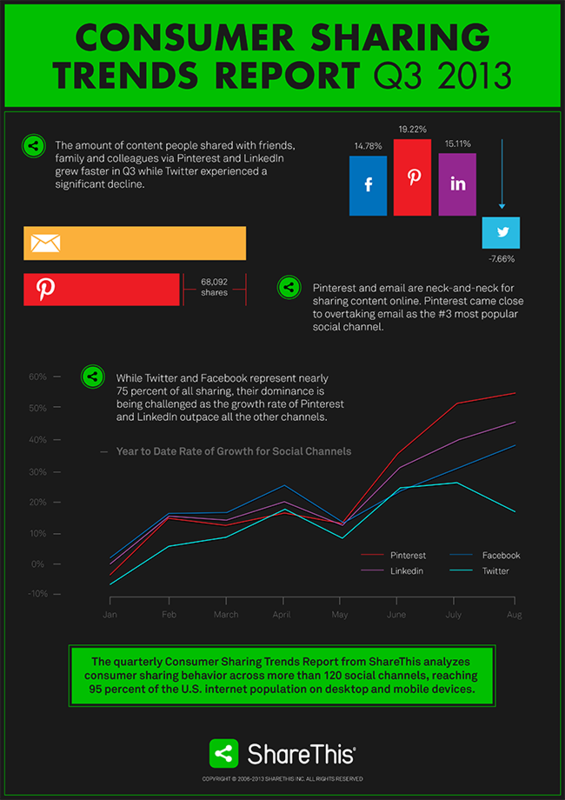 ShareThis’ Consumer Sharing Trends Report for Q3 2013 shows that the two networks are growing faster than Facebook, Twitter, and email. ShareThis is a company that provides social sharing buttons for different platforms, including websites, blogs, newsletters, and mobile apps. The report measures and compiles data from millions of social shares per month. ShareThis found that in Q3 2013, Pinterest sharing increased by 19.22%, while LinkedIn sharing increased by 15.11%. Facebook sharing increased by only 14.78%, and Twitter sharing actually dropped by 7.66%. Email sharing fell by around 3%, and increase in Pinterest sharing during August-September almost made it overtake email as the third most popular social channel. LinkedIn ranks fifth among the most popular social sharing channels, but its growth rate is not something marketers should ignore. Facebook and Twitter make up about 75% of all social sharing, but the increased growth rates for both Pinterest and LinkedIn could challenge the two networks’ dominance. Many web marketing companies focus solely on Facebook and Twitter when developing a social marketing campaign. Given how quickly Pinterest and LinkedIn are growing, this could be a huge mistake. The best thing to do is create an integrated campaign that covers at least all five of the top social networks. Talk to us to learn how we can create a social media campaign that helps your brand reach out to its customers and advocates no matter what network they prefer to use.